How can I make Dictionary.app results show up higher in the list of Spotlight results? Finally, I found a hack! I wrote a blog post about this which you can find here (in Chinese). 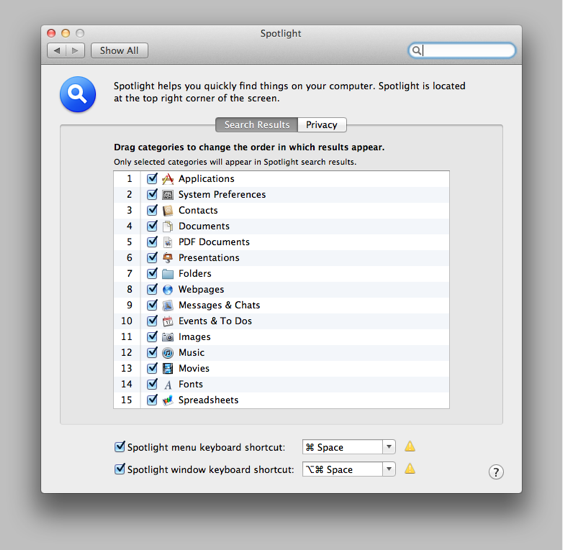 If you do not have this file, change the order System Preferences → Spotlight which will cause the OS to create it. Open System Preferences → Spotlight, you will find a blank entry, this is what we had added above. You can drag it like other entries to change the order as you like. You are done! Now type a word in spotlight and see what happened. 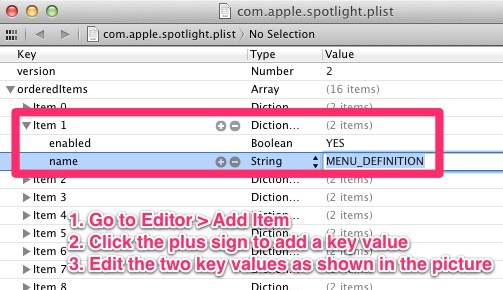 In 10.8+, you can open Spotlight, type in the word to look up, and press ⌘L to jump to the definition within Spotlight. Pressing ⌘D instead of ⌘L opens the definition of the typed word in the Dictionary.app. 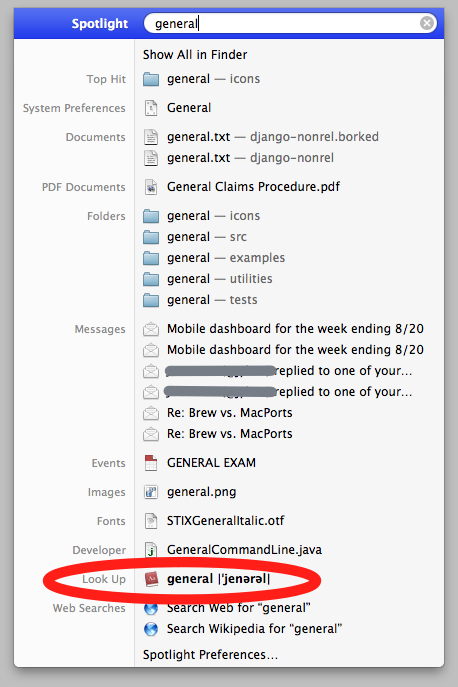 Find your Dictionary in the Applications folder. Drop it in the dock. Highlight a word in whatever application you are working in, and drag and drop it into the Dictionary icon in the dock. Google makes the "Google Quick Search Box" (QSB) which is a lot like QuickSilver and LaunchBar (more like Quicksilver of the two). I think for your purpose, QSB is the best option. Google will give you Dictionary results quite readily based on some criteria. I found that if the definition was not immediately available, I could invoke it more explicitly by typing the word whose definition I am seeking followed by ‘definition’. Here is a little more information about those ‘quick launch’ applications. Google’s QSB is free, quite capable, clean in appearance, but is a little sluggish. … LaunchBar is faster, pretty powerful, not as ‘pretty’, and costs around USD 25-40. Quicksilver has been discontinued, and the developer has recommended that users switch to LaunchBar. Not the answer you're looking for? Browse other questions tagged lion spotlight dictionary . Is it possible to make “Look Up” appear higher in Spotlight? Is it possible to remove Web Searches from Spotlight? How to hide files found in spotlight? Disable dictionary results in Spotlight? Why doesn't El Capitan Spotlight search in custom dictionary?